We stayed in Consolação, at the Boa Onda Guest House. The guest house is great, very relaxing, very clean, and very near the beach. The staff there and the owners are extremely cool, friendly and helpful. The town is small with a few restaurants, but Peniche is close by, and if you have access to a car, Baleal is about 10mins away with lots of great places to eat. Consolação is not very touristy, it’s quiet, beautiful, with a fantastic beach. Exactly what we needed. It has been 3 years since my previous surf lessons, so I’d forgotten a lot. The instructors were very thorough, they did great warm ups and explained things very well. They keep an eye on everyone and constantly offer individual tips for improvements – I went back after each session and wrote invaluable things down in a notebook. I really enjoyed the lessons. They were very friendly too so it was fun to learn. The beaches are great for beginners to advanced beginners. Even with small waves, there are opportunities to learn and fortify the basics. I’d go back there again in a heartbeat for more lessons. The beach is just across the road from the guesthouse too, so no lengthy van rides to start. For intermediate lessons, they search out bigger waves in the area. The accommodation was fit for purpose. It was close to the beach. We had the best food at this beach while we were in Portugal. The area is quite calm, not too lively, ideal for a calm holiday with surf and yoga classes. I liked the surf lessons very much. The instructors were knowledgeable and took care of making their best to make sure we have a great experience. They were supportive and we like the beaches very much as well. BOA ONDA guesthouse is a really peaceful and relaxing place, Riccardo and his crew are really nice guys. Always supporting to any queries and always try to make you happy. I liked the fact that the guesthouse is not so big, it makes it a cosy place. And that way you get enough attention in the surf and yoga classes. I was also happy to be able to use a bike from the guesthouse to explore Peniche. Wow! What a great week with everyone at the guesthouse! Big up Riccardo and Julio, not only did they help me advance my surfing knowledge and skills we also fun doing it! Chiara’s daily yoga sessions were the perfect introduction to Hatha and just what you need after a day on the waves! Valentina’s lunches were so delicious I had them daily! Goda (Godess), Luna and iLiana were the perfect hostesses from chilling out jammin’ songs on the guitar to big nights in Baleal. 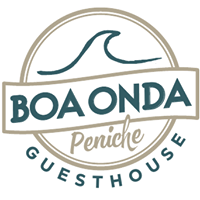 I felt great after staying at Boa Onda and I hope to return one day! Thank you all! Good vibes, Much love! I stayed in a dorm which was spacious clean and tidy. The bunk beds were a bit old and creaky but comfortable enough and there was a balcony for drying off swimwear after a surf. I felt very safe as the hostel was small and well managed by a couple who were friends with the owners. Cooking facilities were available but I enjoyed having the breakfast on site (cereal, toast, homemade cake, juice, fruit and proper coffee). It’s in a small town with a number of small reasonably priced restaurants, mostly selling seafiod but a pizzeria too. I don’t think there’s much late night life but you can get ataxi for ten euros each way to Baleal for late night bars now and then without having to stay there. Beautiful beach, generally suitable for surf but we got driven to another a few miles away when needed. Surf lessons were generally very good, conditions the first day weren’t suitable for beginners but I understand the conditions are variable. Knowledgeable and attentive instructors and lots of room on the beach to practice. Great place to learn to surf. Nice place to stay and surf. Great staff, very kind and professional. Riccardo is number 1!